You must have at least one Wood scrap in your inventory to start building it. Repair with a wood scrap. This woven fence is purely a decoration and stops neither creature nor man. 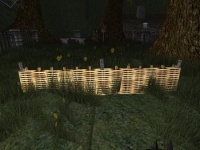 Players can open containers and take items from behind a woven fence. Woven fences are easy to destroy. A woven fence takes longer to construct than a wooden fence, but wood scraps are much easier to obtain. That being said, building even a mediocre quality woven fence is difficult, because higher quality wood scrap is hard to find. Being a byproduct of construction, wood scrap has only 10% of the original material quality. The only way to obtain high quality wood scrap is to cut down young or shriveled fruit trees. The maximum quality a woven fence can be improved to depends on the player's carpentry skill and the utilized wood scrap's quality: (Carpentry skill + Wood scrap QL) / 2 (tested with 80 carpentry skill, and 4-8 carpentry skill on test). Several 1.5QL wood scraps, for example, allow improving to about 40QL with 80 carpentry. Repairing a woven fence requires 1.5 kg of wood scraps. Each wood scrap will repair up to 10 damage, depending on quality and repairing skill, and uses 1.5 kg, on its own, or from a larger bunch of wood scraps. This page was last modified on 13 March 2019, at 15:20.